Of all the films made in East Germany, the Märchenfilme (fairytale films) fared the best when it came to western distribution. Thanks to kid film friendly companies such as K. Gordon Murray and Childhood Productions, these films were some of the very few that received U.S. distribution. East-West borders seemed to melt away with the Märchenfilme. Fairytales offered a nice neutral territory for both sides. 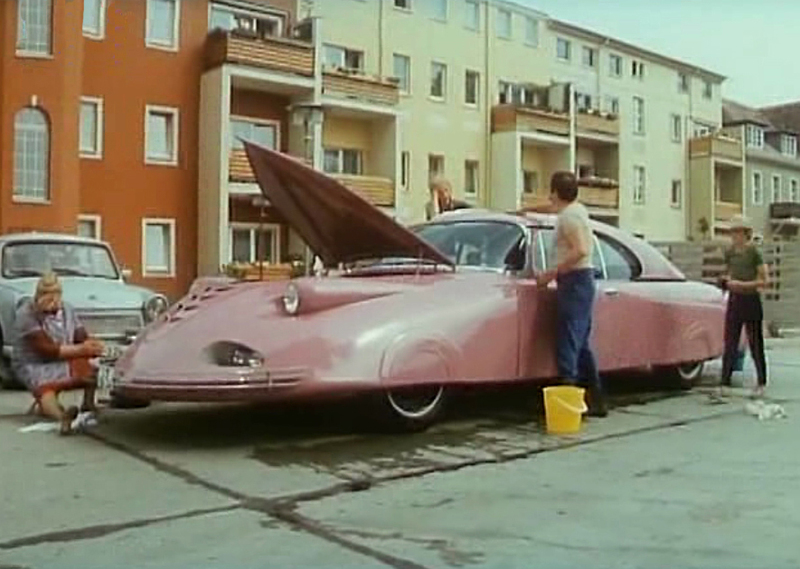 Sure the rich are often the bad guys in the East German films, but they are in the original fairytales too. DEFA’s production standards didn’t hurt either. The films are colorful, imaginative, and well produced. 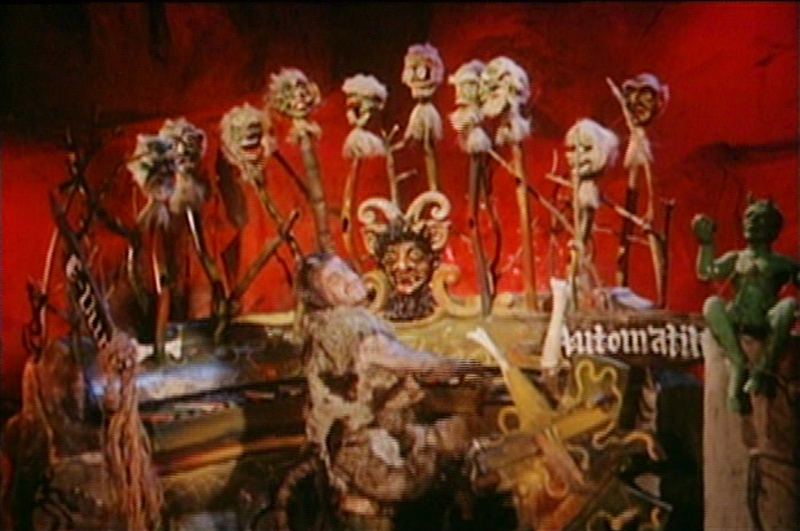 The Tinderbox (Das Feuerzeug) is based on Hans Christian Andersen’s oddly amoral fairytale of the same name. The story relates the adventures of a poor soldier who helps an old woman retrieve from a secret chamber her magic tinderbox (a lighter, when you come down to it, but “The Lighter” just doesn’t have the same ring). The soldiers decides to keep the tinderbox and later discovers its magic powers just in the nick of time. The film follows the original closely, but takes a few liberties, sometimes for the better. In the fairytale, the soldier kills the old woman for no reason other than she wouldn’t tell him why she wanted the tinderbox. In the film, she turns into a giant snake and is about to attack him before he kills her, thus betraying her deceit and converting her into a real threat. Other things aren’t quite as effective in the films as they are in the original story. 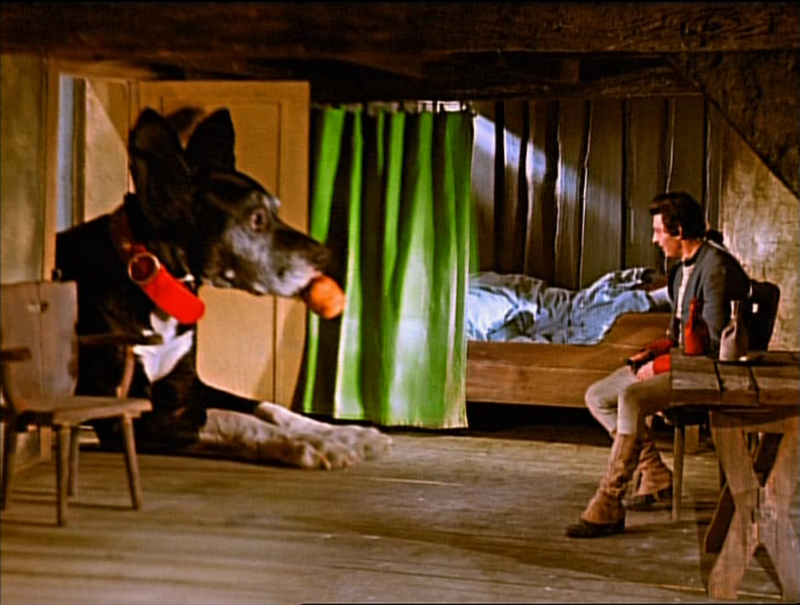 In the fairytale, three chests full of coins are guarded by gigantic dogs, with each dog bigger than the last. 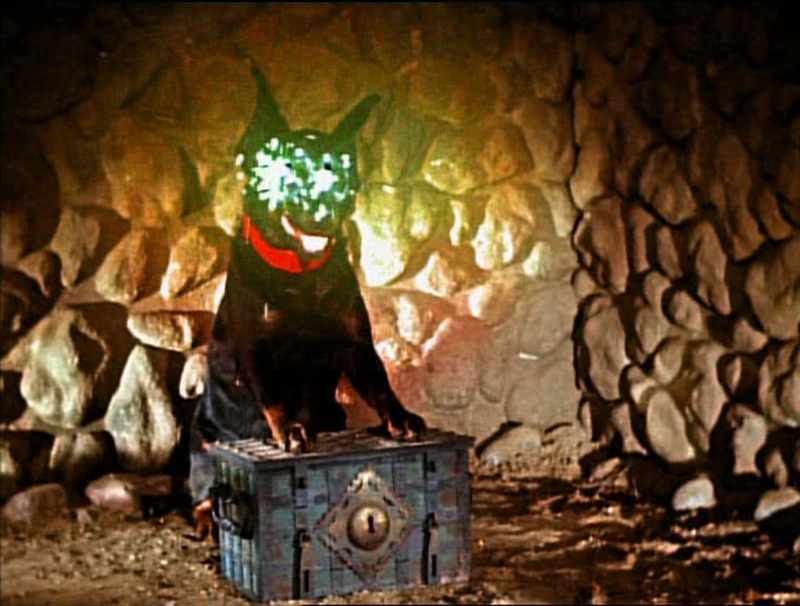 To accomplish this in the movie, the filmmakers start with a dock-tailed Rotweiler with bat-wing ears pasted on him and projected in split screen to make him look enormous. To create the effect of the dog having “eyes as big as dinner plates” as described in story, large white rings are drawn around the dog’s eyes, and a sparkler effect is added to the eyes optically to make it look more threatening. The end result is more humorous than scary, but, it must be said, this doesn’t interfere with the film’s entertainment value at all. The Tinderbox is directed by Siegfried Hartmann, who was one of the first directors to come out of DEFA’s Nachwuchsstudio program, intended to teach young directors their craft. He served as an assistant director on The Story of Little Mook, one of DEFA’s first Märchenfilme, and still the holder of the top box office spot for East German films. 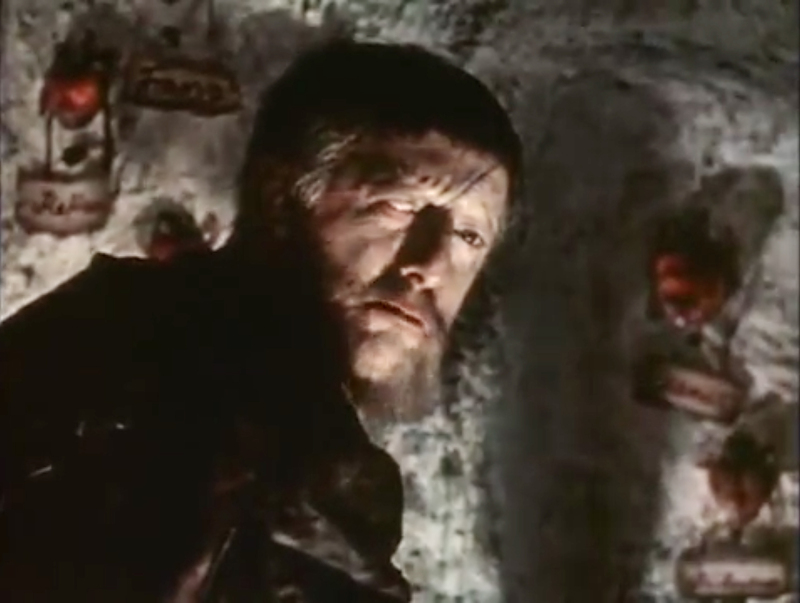 The Tinderbox was Hartmann’s second film. It was a hit and would affect the course of Hartmann’s career. Although he made films in other genres, he is still best known for his Märchenfilme. 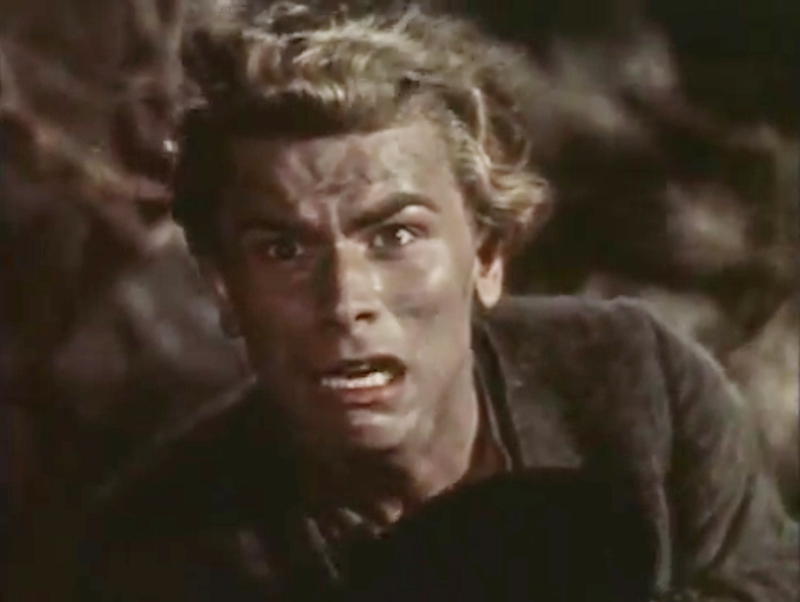 Like fellow DEFA actor, Raimund Schelcher (see Castles and Cottages), Ludwig had trouble with alcohol, admitting at one point, “I’m not a drinker, but a drunk.” Like Shane McGowan of the The Pogues, the quality of his stage performances rose and fell according to the level of alchohol in his bloodstream. Sometimes performances had to be cancelled due to his intoxication. Other times, he went out drunk, and it showed. His autobiography was aptly titled Nüchtern betrachtet (Sobriety considered). Ludwig died in Berlin in 1999. The special effects for the film were by Ernst Kunstmann and his daughter, Vera. Ernst Kunstmann, as I’ve discussed in previous articles on this blog, is one of the grand masters of cinema effects. His work appears in some of the all-time classics of German cinema, including Metropolis, The Last Laugh, Triumph of the Will, and The Testament of Dr. Mabuse. After the war, he settled in the east and contributed effects to many of DEFA films, including Chemistry and Love, the Ernst Thälmann films, The Silent Star, and all of the early fairytale films. His daughter began working with him in 1957, starting with The Singing, Ringing Tree, but left the field after working on Leute mit Flügeln. Ernst Kuntsmann retired in 1963 after doing the optical effects for Günter Stahnke’s Vom König Midas. He died in 1995. 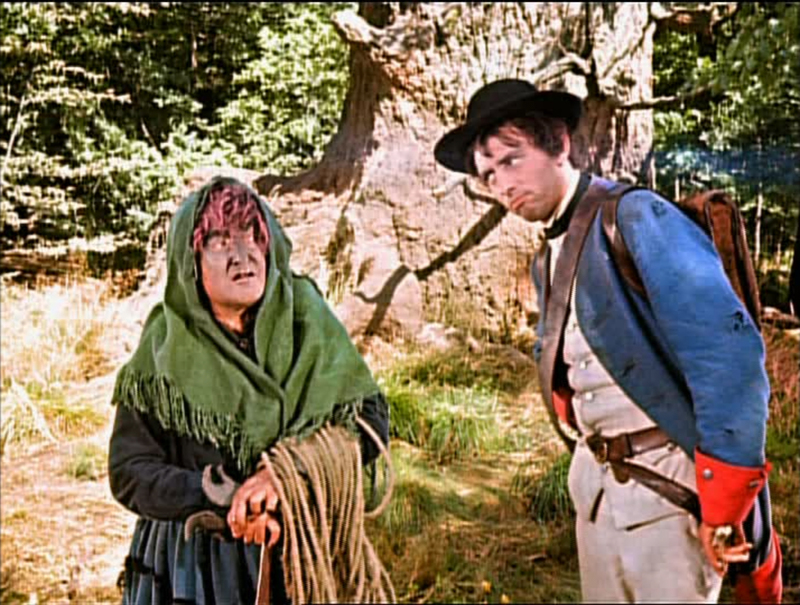 The Tinderbox comes in at number 16 on the GDR top-grossing film list and it’s easy to see why. It is a fun film that, unlike too many children’s films, is as much fun for adults as it is for kids. Buy this film (part of a double DVD set with The Singing, Ringing Tree).